NOV 21: BJP leader Subramanian Swamy will be presented Brahm Gaurav award here on November 24 by Brahm Foundation. “Swamy is being awarded for his service to society at this critical juncture,” national convenor of Brahmin Mahasameelan B.L. Sharma said in a statement. 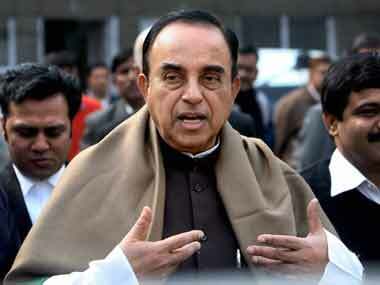 He said Swamy will be felicitated on the occasion of the Brahmin convention slated here for Sunday. Besides Swamy, litterateur Nathmal Chulet, executive editor of ‘Dopahar Ka Samna’ Prem Shukla, social worker Suresh Oak, and environmentalist Umesh Sharma. Meritorious students will be given the Bramha Gyan Puraskar on the occasion, Sharma said. The convention will be inaugurated by Mahamandaleshwar Swami Samvidanand of Kailas Math. Noted industrialist Bhavani Shankar Sharma and Dr. Anil Sharma from the Bombay Hospital Group and founder of the Bhagwan Parshuram Sena Om Prakash Sharma will be the chief guests for the function.